This week’s Torah portion we read the following, יז וַאֲנִי הִנְנִי מֵבִיא אֶת-הַמַּבּוּל מַיִם עַל-הָאָרֶץ לְשַׁחֵת כָּל-בָּשָֹר אֲשֶׁר-בּוֹ רוּחַ חַיִּים מִתַּחַת הַשָּׁמָיִם כֹּל אֲשֶׁר-בָּאָרֶץ יִגְוָע: יח וַהֲקִמֹתִי אֶת-בְּרִיתִי אִתָּךְ וּבָאתָ אֶל-הַתֵּבָה אַתָּה וּבָנֶיךָ וְאִשְׁתְּךָ וּנְשֵׁי-בָנֶיךָ אִתָּךְ: 6:17 ‘Behold, I, even I am bringing the flood of water upon the earth, to destroy all flesh in which is the breath of life, from under heaven; everything that is on the earth shall perish. 6:18 ‘But I will establish My covenant with you; and you shall enter the ark you and your sons and your wife, and your sons’ wives with you. (NASB) Notice how the Lord is establishing His covenant with Noach and those who come with him (his wife and children). 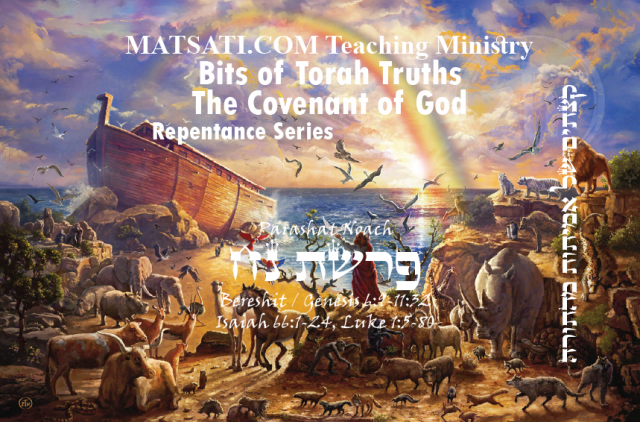 We read in the opening of the Torah portion that Noach was a righteous man (נֹחַ אִישׁ צַדִּיק), so the concept here is those who come with him, who want to be saved from the impending wrath, walk and live in righteousness (faithfulness) and seek a covenant relationship with the Lord (faith). Those who enter the ark will be characterized by these things. This is illustrated in the contrast found in our reading this week, between the נִשְׁמַת חַיִּים from the creation account (Bereshit / Genesis 2:7) to what we read here in the verse רוּחַ חַיִּים (spirit of life) speaking to us of all peoples having been offered this option, to believe in the God of Israel and walk in His ways, but only a few accepted this way of life. Note how these same concepts may be illustrated in the anti-Torah modern theologies that have been taught for thousands of years.